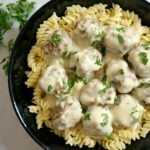 Healthy Swedish Meatballs in a rich gravy sauce, served on a bed of fusilli pasta; a complete meal for a family dinner. 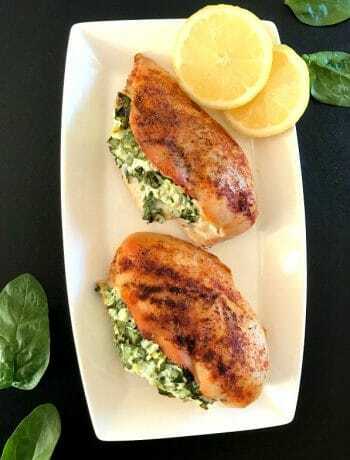 Satisfying, easy to put together, and really tasty. If I have a choose one dish I always go back to when l have no idea what else to prepare for dinner, this has to be pasta. With any sauce, with or without meat or other vegetables, job done, everybody’s happy. It really is as simple as it sounds. And in about 99% of cases, it goes down a treat with the whole family, fussy little munchkins included. The Italian meatballs with tomato sauce are perhaps one of the world’s most popular dishes. But you’d be surprised how tasty and equally famous the Swedish meatballs are. 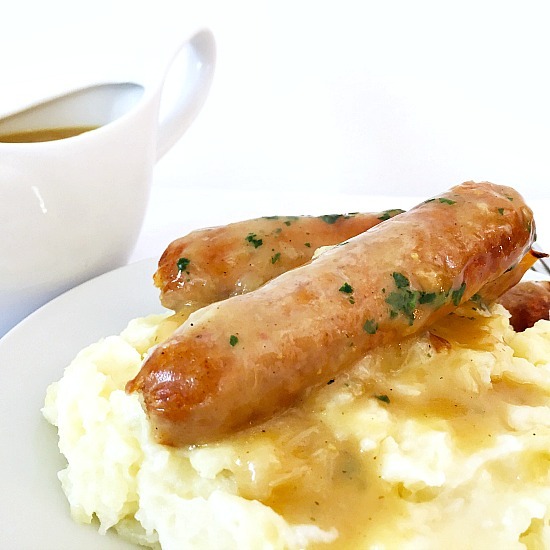 The rich gravy sauce is, in my opinion, the star of the show. It makes the whole dish taste absolutely beautiful. How do you make healthy meatballs? Meatballs can be made in endless ways, but baking them is not only healthier, but also super tasty too. In a bowl, add the ground beef, grated onion, carrot, spices and egg, and mix well to combine. 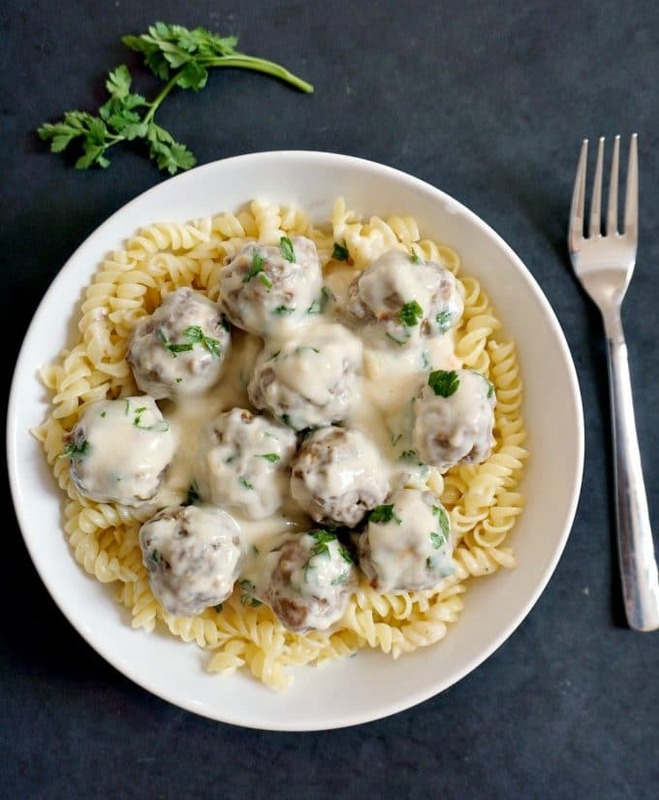 How do you make the sauce for Swedish Meatballs? This Swedish gravy sauce is something else. 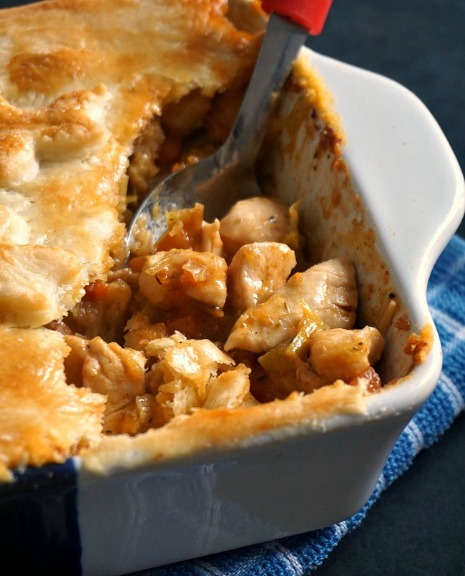 The addition of sour cream makes it so silky and flavourful. I could really have it anytime of the day. It’s this very sauce that makes the Swedish meatballs different from any other meatball recipe. To make it, heat up a pan, add the butter and melt it. Add the flour, whisking well to form a smooth paste, then pour over the beef stock, and continue to stir until it thickens. The cream can now go in, which should be at room temperature to avoid curdling, then season well, add the meatballs to it, and cook for a further 2 minutes. And that’s the best sauce done! 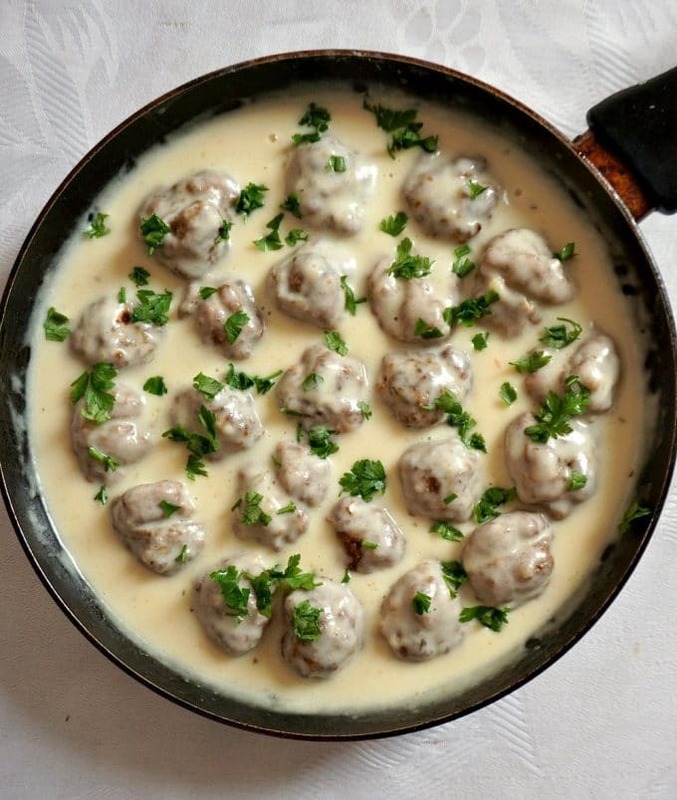 What side dishes go well with Swedish meatballs? 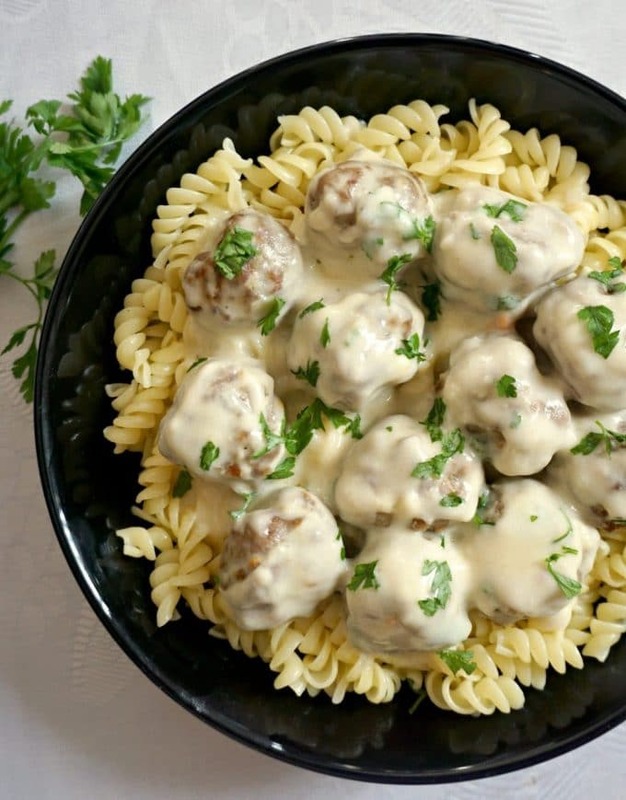 I chose to serve the Swedish meatballs with pasta, but you can go for noodles, spaghetti, mashed potato, or even rice too, it’s just a matter of whatever you have in your pantry, don’t go out of your way to buy the fusilli pasta. I happen to have fusilli because my toddler seems to be a monkey when it comes to any other pasta shape and refuses to eat. Toddlers are weird creatures, by the way!!! Can you freeze the Swedish meatballs? If you have plenty of leftovers after your dinner, the meatballs and sauce can safely be frozen in a tupperware to be enjoyed on a different day. They can easily be re-heated in the microwave or oven, I tend to freeze some food for emergency times when I don’t have time to cook. And trust me, that happens a lot if my little ones are all over the place and I can’t possibly be in the kitchen. If you’ve tried this HEALTHY SWEDISH MEATBALLS or any other recipe on the blog then don’t forget to rate the recipe and let me know how you got on in the comments below, I love hearing from you! You can also FOLLOW ME on FACEBOOK, and PINTEREST to see more delicious food and what I’m getting up to. To make the meatballs, peel and grate the onion and carrot and add them to a large bowl together with the beef and egg. Cut the slice of bread into cubes, and soak in milk. Squeeze out the excess milk and add the bread to the other ingredients. Season with salt, pepper, add the allspice, parsley and vegetable oil and mix well to combine. 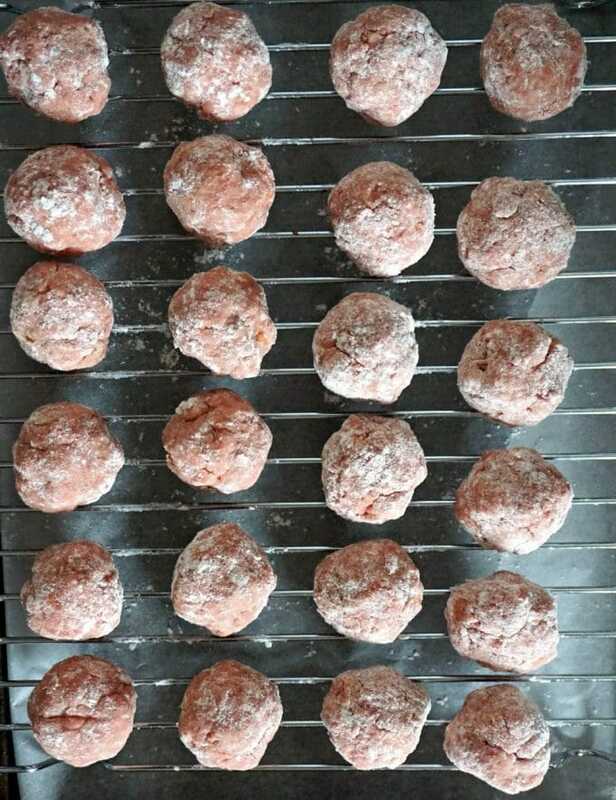 Shape out meatballs, depending on their size you should get more or less 24 meatballs. Cover them with flour, shaking any excess off them, arrange on a baking tray, spray deliberately with cooking oil, and bake in the pre-heated oven at 180 degrees Celsius (360 Fahrenheit) for 30 minutes. In a pan, add the butter and allow it to melt. Whisk in the flour and stir for 30 seconds, then add the beef stock and continue to stir until it thickens slightly. Mix in the sour cream and the black pepper, and stir for about 2-3 minutes. Add the meatballs and stir for a further 2 minutes. Remove from the heat and garnish with fresh parsley. Serve immediately with pasta. Worth making it as it looks delicious! !